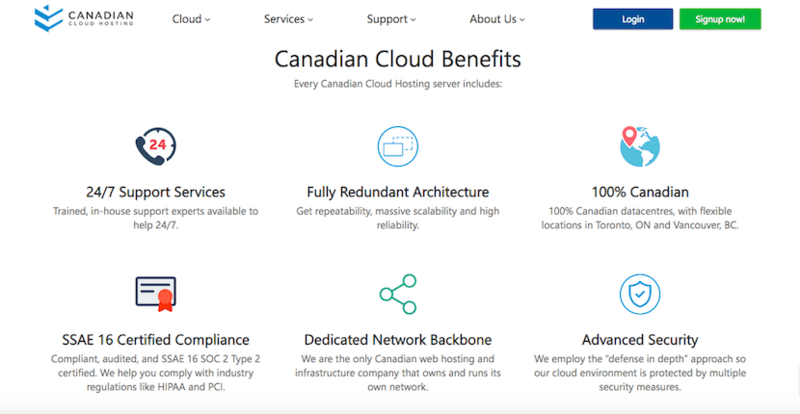 Canadian Cloud Hosting Review 2019: Is Canadian Cloud Hosting a Good Hosting? Canadian Cloud Hosting is a 100% cloud-based website hosting service (hence the name). They offer excellent uptime, Canadian-based servers, and 24/7 customer service. In business since 1998, Canadian Cloud Hosting provides cloud hosting designed for businesses and enterprises. They have three data centers located in Vancouver and one in Toronto. Their website and support are in English. They offer five SSD Cloud Server plans that all use RAID 10 SSDs for reliability and faster disk read times, Tier 1 bandwidth with a minimum of 1 TB monthly data, and KVM virtualization for performance and security. Resources range from 512 MB to 8 GB of RAM and from 20 GB to 80 GB drive storage, depending on which level you choose. These premade plans – which also feature instant setup – can be fully customized at the checkout in terms of data center location, operating system, RAM, RAID controller, database type, control panel type, number of IPs, server location, and backup frequency. The Private Cloud product, which is aimed at enterprises rather than individuals, comes in four flavors with 32 GB to 96 GB RAM and 2 x 2 TB SATA RAID1 to 2 x 256 GB SSD RAID1 storage. All plans come fully managed with enhanced security features and can easily be scaled by adding nodes or resources once deployed. Unlike the Cloud Server plans, the Private Cloud packages are not customizable via the website. Unusually for such high-end services, Canadian Cloud Hosting lets you pick a plan and pay 100% online. For most (but not all) packages they also commit to instant activation. Canadian Cloud Hosting’s budget ‘SSD Cloud Server’ and ‘Flexible Cloud’ products are very good value for money and are very well priced compared to local and international companies providing a similar service. Just be aware that customizations at the checkout will cost extra, and there are no discounts for committing to longer terms. At the other end of the price spectrum, the ‘Private Cloud’ products are very expensive in absolute terms (even if not compared with other vendors). 24/7 support is provided by telephone, ticket, email, and live chat. They also have an FAQ section on their website; and a client-only area which may well contain a more detailed knowledge base for all I know. I’ve contacted this company via live chat at various times of the day, and they have always been very helpful and polite. Overall, I’m impressed by the level of their customer service. Canadian Cloud Hosting is a veteran of the information technology industry. They’ve been in business since 1998, have two data centers in Canada, and have an excellent uptime backed by a service level agreement. Check out Canadian Cloud Hosting’s web hosting options today! Wondering how Canadian Cloud Hosting stacks up against other Web Hosting companies? Enter any other Web Hosting company and we will give you a side-by-side comparison.